Practice Applied Chemistry questions and answers for interviews, campus placements, online tests, aptitude tests, quizzes and competitive exams. This set of Applied Chemistry Multiple Choice Questions & Answers (MCQs) focuses on “Geothermal Energy”. 1. The geothermal energy is the ________ from the earth. Explanation: The geothermal energy means the heat from the earth. The name geothermal itself has the meaning. The word geo means the earth and thermal means heat. 2. Resources of geothermal energy range from shallow ground to hot water. Explanation: Resources of the geothermal energy range from shallow ground to hot water and hot rock found few miles beneath the earth’s surface and deeper extremely high temperature molten rock called magma. Explanation: The first geothermal electricity was produced in Italy in1904. The geothermal energy is also used to produce the electricity. 4. How much deep the earth should be drilled for reservoirs? Explanation: The earth is drilled up to 1.6km deep mostly. Some times more than that under ground reservoirs is to tap stream and very hot water. Explanation: The hot water from the ground is used to turn turbines. The turbines drive the electricity generators. Thus the electricity is produced. 6. How many types of geothermal power plants are there? Explanation: There are three types of geothermal power plants. They are dry steam geothermal power plant, flash geothermal power plant and binary geothermal power plant. 7. Dry steam geothermal energy generator takes steam out of __________ in the ground. Explanation: Dry steam geothermal energy generators takes steam out of fractures in the ground. It is used to turn turbines directly and produces the electricity. Explanation: In flash geothermal power plants takes the high pressure hot water from the ground and turns it into the low pressure cool water. The steam that is produced is used to drive the turbine. Explanation: Binary geothermal power plants, the hot water is taken from the ground and the secondary fluid is passed with much lees boiling point than that of the water taken from the ground. 10. Most of the future geothermal power plants will be of ____________ type. Explanation: Most of the future geothermal power plants will be of binary type. It uses the secondary fuel having lees boiling point than water and very efficient method. 11. Unlike other power plants, in geothermal power plants no __________ is burned. Explanation: Unlike other power plants, in geothermal power plants no fossil fuel is burned. So, there is no emission of CO2 and other gases and conversion. Explanation: The hot water is sent into the heat exchanger. It turns the hot water into vapour. The hot water is taken into the hot rocks, ocean surface and ocean thermal. 13. The __________ is used to turn the power into AC. Explanation: The synchronous generator is used to turn the direct current power into the alternating current. There is a speed control of vapour in between the valve and synchronous generator. Explanation: The cooling water is again sent into the condenser. So, that water can be used again through pump into heat exchanger. 15. From how many ways we can take the geothermal energy? Explanation: The geothermal energy takes the three types of sources. They are hot rocks, ocean surface and ocean thermal are the three main sources of geothermal energy. 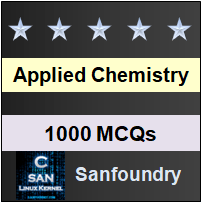 Sanfoundry Global Education & Learning Series – Applied Chemistry. To practice all areas of Applied Chemistry, here is complete set of 1000+ Multiple Choice Questions and Answers.